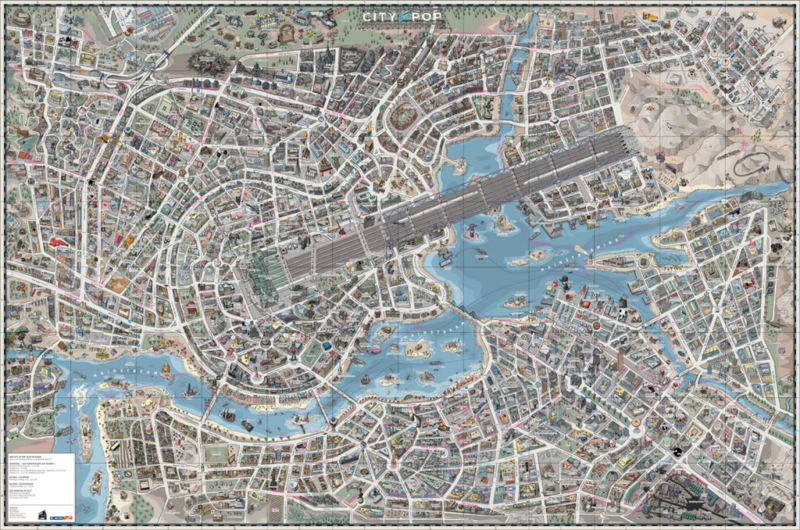 Fictional maps continue to occupy a growing genre in cartography through the increase in the use of fictional worlds in film and gaming. It’s not entirely new in the sense that literary works have long used fictional maps as part of the setting of their story (for instance Treasure Island in MapCarte 36, 100 Aker Wood in MapCarte 14 and The worlds of J. R. R. Tolkein in MapCarte 247). Music, also has seen imaginary worlds devised to tell something of the culture and circumstances such as the Manchester Music Map featured in MapCarte 205. Here, a German radio station, working with design firm Designliga, has created a fictional music map as a celebration of their station and the music it has championed since it hit the airwaves. 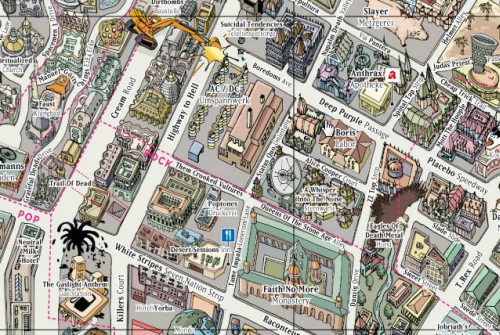 The map is hand drawn in detail and showcases the history of pop culture. The design goal was to illustrate the history of music in a form other than the written word or a magazine article. 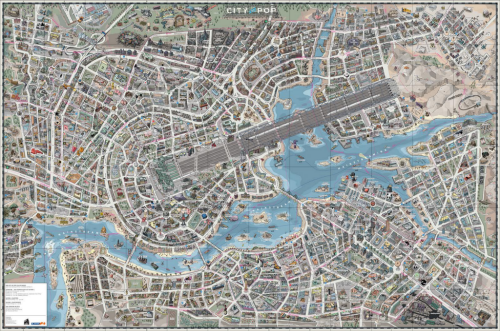 The imaginary city metaphor allows interconnections to be brought to life. For instance ‘Depeche Mode Midway’ separates the pop district from the new wave quarter and the Bryan Ferry sails down the Mainstream River. 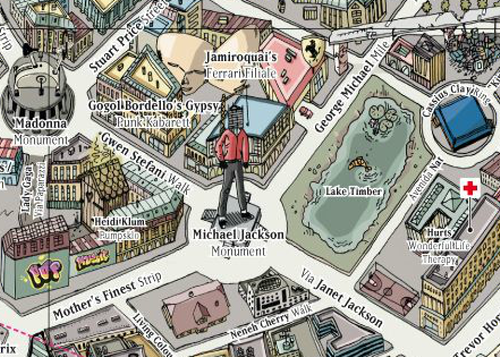 The map is not devoid of satire either as Michael Jackson has been erected as a monument in the heart of the pop district but with his face obscured by scaffolding. The map contains over 1300 streets and 500 places with a timeline printed verso. The main design motif is an electric guitar whose strings appear as railway lines entering a station. This isn’t a normal city though great care has been taken to combine musical imagery and references into a believable landscape. It’s a fascinating and engaging way to present information that would otherwise be seen in a less visual form. It illustrates the versatility of the map to act as a canvas on which people can create fantastic illustrations of even the most non-spatial phenomena. You can view the online version here and more on the map’s concept by Designliga here.